Hyundai ix35 goes on sale in the UK on March 25th with a starting price set at £16,495! 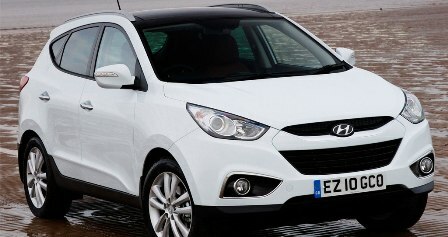 Hyundai UK today announced it will commence the sales of its newest model, the ix35 crossover on March 25th. The UK unit of a Korean largest automaker also released a few more details about the ix35’s pricing and trim levels. Buyers of the all-new ix35 will be able to choose from Style and Premium trim levels and front- or four-wheel drive. The entry-level Style trim comes equipped with standard features such as 6 air-bags, ABS, ESP, ESP, air-conditioning, trip computer, Bluetooth connectivity, leather-wrapped steering wheel, heated front and rear seats, 17-inch alloy-wheels, reverse parking sensors and door mirrors with integrated LED side repeaters. Higher-end Premium package ads dual-zone climate control air-conditioning, automatic headlights, cruise control, full size panoramic glass sunroof, keyless entry, a start/stop push button and rain-sensing wipers. It also gets part-leather upholstery, roof-rails, electric folding door mirrors and upgrades 17-inch alloy-wheels to 18-inch wheels. There are a few optional features available as well and those include a touch-screen satellite navigation, leather seats and a reversing camera. At launch the ix35 will only be available with a base 2.0L petrol engine, which generates 161 horsepower and 2.0L R-diesel engine with 134 horsepower. Later in the year, Hyundai will broaden the ix35 model range by adding two new four-cylinder engines to the line-up. The ix35 will get an entry-level 1.7L CRDi diesel engine with 115 horsepower and 1.6L Gasoline Direct Injection engine that generates 140 hp. More details on the new engine options will be released closer to their launching date set for the summer of 2010. Pricing: the ix35 Style model will cost £16.495, while the range-topping Hyundai ix35 Premium will go for £20.745.